As I walked into the kitchen yesterday, I felt the need for a light cake. A coffee cake seemed like an excellent idea. And so this cake was born - a light but flavourful espresso sponge dripping with a thick white chocolate ganache and topped with a handful of sugared rose petals. Making sugared rose petals is very easy, if a little fiddly. It's just a matter of painting them with egg white and covering then in fine sugar before letting them dry. It's important that they're not sprayed with chemicals, so picking from your garden is best. I made mine yesterday while I watched the finals at Wimbledon. Much as I love watching tennis, I felt I could sit on the sofa making these and watch Rafa winning easily at the same time. (Oh how I wish Federer had been there - I was so upset when he went out). I have to admit to something. I didn't use real, brewed espresso. I used espresso powder that I bought the other day, mixed 1tbsp/1tbsp with boiling water. I know it's not the real thing, but it worked a charm in this cake. I had forgotten what an odd looking ganache my favourite white chocolate from Green & Blacks makes. It's almost slightly green and translucent until it cools fully, when it's whiter. So forgive the ganache in the photos for its slightly poorly appearance - I couldn't wait to take the photos and eat some! Before we knew what had happened, Mum and I had polished off nearly half of the cake. I particularly enjoyed mine with a few fresh raspberries to add a tart element. The sponge is lovely and light and has great flavour, especially combined with the ganache. A success! Preheat the oven to 160C/ 320F. Grease and line the bottom of a 8"/20 cm round tin. Cream the room temperature butter and the two sugars together until fluffy. Add an egg, beat well, then add the other (you may need to add a tbsp of flour in between the eggs). Sift in the flour and baking powder and fold to combine. Add the espresso and vanilla and fold in. Spoon into the prepared tin and bake for about 30 minutes, or until a skewer/toothpick comes out clean. Remove to a wire rack and cool slightly before removing the tin and paper. Carefully pull petals off the rose - I only took 20 or so. Separate an egg and put in a small pot. Put the sugar in a small bowl/pot. Using a paintbrush or pastry brush, lightly cover a rose petal in the egg white. Either carefully press the petal into the sugar or sprinkle it on. Put to dry on a sheet. Repeat for all your petals. Leave to dry for about 30 minutes or until fairly hard before using. Break the chocolate up into small pieces and place in a small bowl. Heat the cream until nearly boiling and pour over the chocolate. Leave for a few minutes then stir until smooth. 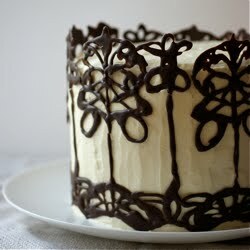 When it has cooled slightly, pour over the cake and arrange the petals on top. oh wow this cake looks yummmy! the flavours sound so interesting yum! Great looking cake, so girly and summery with the rose petals. oh, the combination of flavors here sounds so unique and yummy!